Three films that animator Frank Mouris prepared while a graduate student at Yale University’s School of Art and Architecture, and that are now in the possession of Yale’s Film Study Center, have just been guaranteed preservation through a grant from the National Film Preservation Foundation. 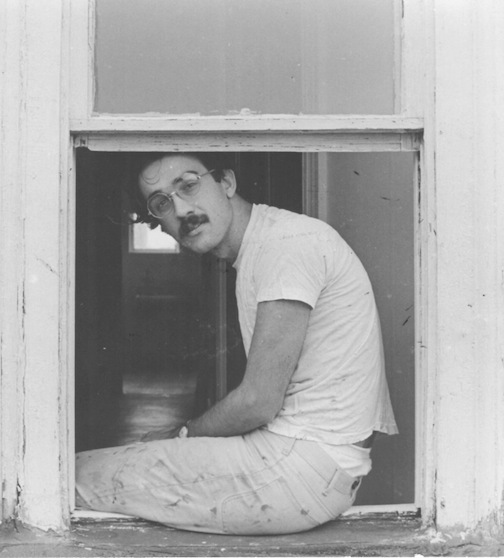 Frank Mouris in a New Haven apartment window in the late 1960s, in a photograph by Peter Salter, a graphic-design student who enrolled a year before Mouris. 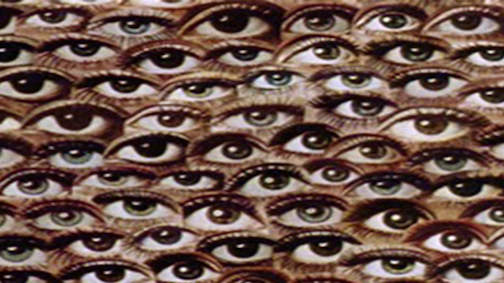 In its 8 minutes and 50 seconds, Frank and Caroline Mouris’s Frank Film, which won the 1974 Academy Award for short film, flashes a collage of magazine illustrations that Frank Mouris had collected over some years. The visual construction builds a strange sense of the excesses of self-interest, consumer culture, and much else. Frank Mouris’s personality emerges as curious and playful, but also, as Eagan notes, uncertain about itself. Yet, another effect of the rapid outpouring of images is a sense of shared humanity. 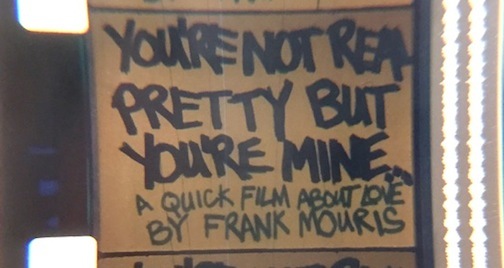 Frank Film would open doors for Frank Mouris, who is now 70, and Caroline Mouris, his production partner and since 1966, wife. They joined a fertile world of experimentation in animation and other film, and took a variety of commercial assignments in television programming and advertising to foot their bills. But few people ever saw the works that Frank Mouris created at Yale University that enabled him and Caroline Mouris to attain convincing levels of craft and vision in Frank Film. Mouris laid the groundwork for his career in short films he made while a graduate student at Yale’s School of Art and Architecture. 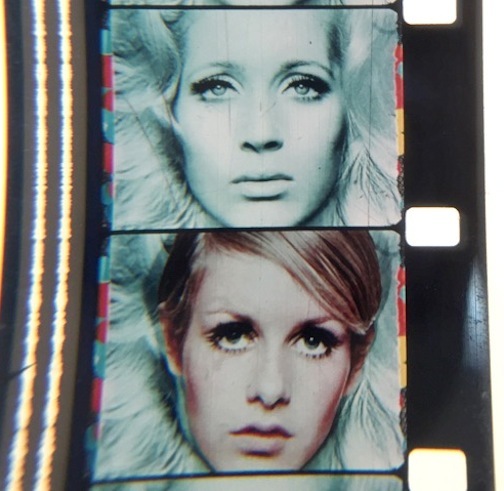 Now, three of those films that are in the possession of Yale’s Film Study Center – a fourth is likely to join them soon – have just been guaranteed preservation through a grant from the National Film Preservation Foundation. The three are: Chemical Architecture, Quick Dream, and You’re Not Real Pretty But You’re Mine. The US Congress created the NFPF in 1996 as a charitable affiliate of the National Film Preservation Board of the Library of Congress. 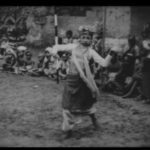 Since then, it has provided preservation support to some 300 institutions and preserved more than 2,200 films through grants and collaborative projects. 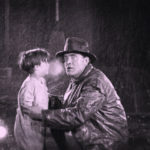 Among its activities, the Board recommends each year 25 films worthy of being added to the National Film Registry on the grounds that they are “culturally, historically, or aesthetically” worthy of perpetual preservation. In 1996, Frank Film was placed on the Registry. 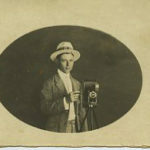 Brian Meacham has been gathering work by Yale film-makers – past and present faculty members and graduate and undergraduate students — since becoming two years ago the Archive and Special Collections Manager at Yale’s Film Study Center, which proposed the preservation of the Mouris films to the NFPF. 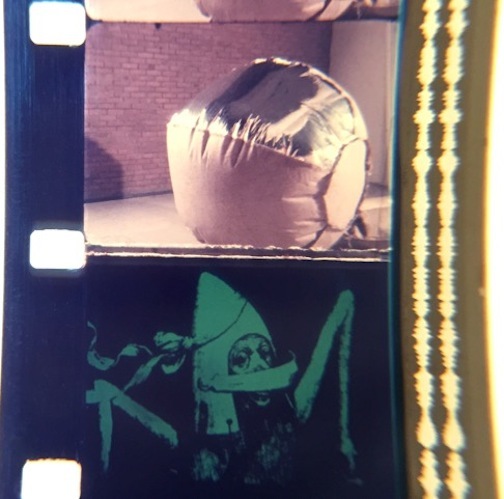 While previously working at the Academy Film Archive in Los Angeles, Meacham says, he met Frank Mouris at a film gathering: “I was familiar with Frank Film, and that day Frank screened Coney,” his 1975 stop-motion portrait of Coney Park. When Meacham asked if Yale could look after anything Mouris had made at Yale, “he was immediately enthusiastic, and told me he had all the originals of a number of films me made here,“ says Meacham, who traveled to the Mourises’ home in upstate New York and received a donation of the original elements of the graduate-school films in return for conservation and preservation. That Frank Mouris would be pleased to donate his early films makes perfect sense given that, as he puts it, “the early Yale experiments were a seed bed for Frank Film and, much later, Frankly Caroline” (their later portrait of Caroline Mouris) in terms of the Mourises’ work in collages of magazine photographs on acetate animation cells and, later, on paper. 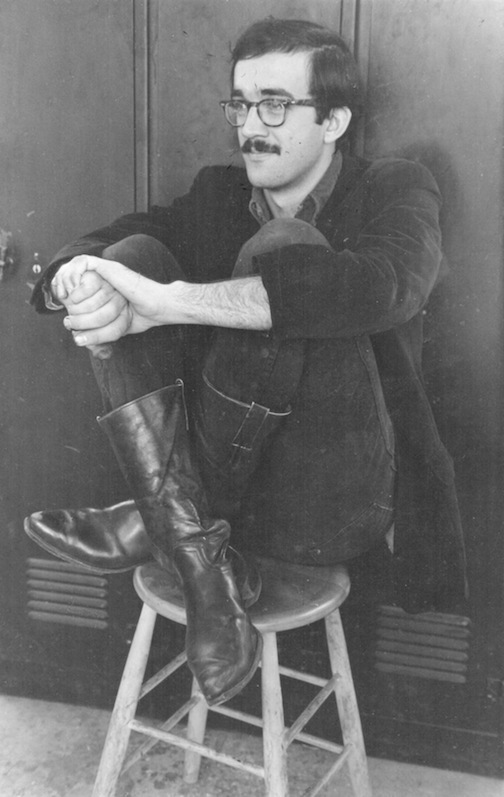 Frank Mouris in a Yale University graphic-design class, late ‘sixties; photo by Jane Bobczynski Newcomb, classmate (and, says Mouris, “niece of our famous teacher Norman Ives”). 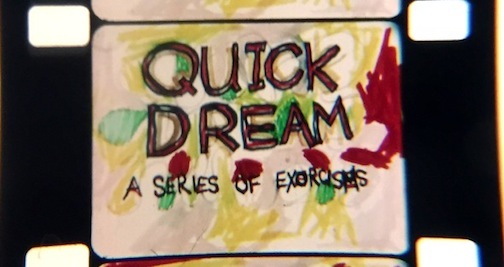 “Quick Dream even had some Avery labels experimentation which so many years later resulted in Impasse: millions (yes!) of animated Avery labels, inspired by the films of Oskar Fischinger,” the mid-20th century German abstract “optical poet. And, he notes, the stop-motion techniques used for Chemical Architecture predated his use of them in Coney, Screentest, an experimental documentary film the Mourises made with support from the American Film Institute, and other films. Frank Mouris began at Yale art school in graphic design, which he explains was “the only art major suitable to coming from Harvard College with a liberal-arts education in what was then called architectural sciences.” He says: “I was lucky enough to have taken as many classes as I could in the then-new building Corbusier’s Carpenter Center for the Visual Arts, but my portfolio couldn’t compete with those of students who were applying to Yale from genuine art schools. So, painting was out, as was a sculpture or printmaking concentration. His entrée into animation came thanks to “our rather Machiavellian department chairman, Alvin Eisenman,” he says. The Yale chemistry professor had cobbled together an animation station by mounting a 16mm camera on a table-top tripod so he could make simple instructional films for his chemistry students. “Next thing we knew,” says Mouris, “all interested graphic designers were allowed to plan a first animated ‘film.’ We each got one half day on the ‘stand,’ plus one 100 roll of Kodachrome II. The supervising faculty member was Irving Kriesberg, a painting instructor in the art school, who had made his own animated films of his (ahem) frog paintings. “When we got our footage back from the lab, we all wanted to edit and add sound, but he assured us that everything was fabulous as it was (i.e., no time, money, or interest from him in pursuing this further). “However, true to Yale’s reputation for getting good visiting critics, Irving arranged a screening as our last class. [Avant-garde Film-maker, printer, sculptor] Robert Breer and [multimedia artist] Red Grooms came, and were incredibly supportive and encouraging, bless them. The result was You’re Not Real Pretty, but You’re Mine. Mouris continues: “Needless to say, I quickly learned the lesson that a film with a soundtrack like that could never be shown publicly without having paid hefty usage fees to the record companies. Still, it was a great learning experience. A classmate, Peter Schlaifer, who had split the day of filming with me on that first experience at the chemistry department, joined me in doing a silent animated film rather than doing yet another two-dimensional poster for a graphic design class assignment. Thus was born Coney Island Eats (which unfortunately disappeared until after Brian Meacham came here to unearth our filmic archives for ‘lost Yale work.’ It just showed up this week, after our best film/animation student from three years of teaching at U.C.S.B., came to visit in her new capacity as a film archivist for the Academy” of Motion Picture Arts and Sciences. “Peter then got me involved in a last-minute outside film project, a short docu/animation film for the New York Craft Museum, who were sponsoring a show on all the things made of plastic, featuring an exhibit ‘structure’ created by the Yale Architectural students (inflated burlap shapes sprayed with plastic, then glued together into a display structure with ‘shelves’, ‘windows’, and ‘doors’ ‑ thus was born Chemical Architecture, which only had the disadvantage of not being able to show the final structure in its finished state, as the film was due before the exhibit opened!). “To his everlasting credit, Peter found out that a first-ever film class would take place on the Yale campus, but it was in the drama school next door to the art school. Boston producer Joseph E. Levine had funded a class to encourage top off-Broadway playwrights to take the train up to New Haven weekly to learn about film, i.e. provide him with a first look at potential screenplays. Lanford Wilson, Maria Inez Fornes, Rochelle Owens, Ron Whyte, et cetera, took the bait/money and ran. Stanley Kauffmann came to give everyone a critical background in feature film. Murray Lerner (and later Bob Young and Michael Roemer) came to teach everyone how to use a Bolex. 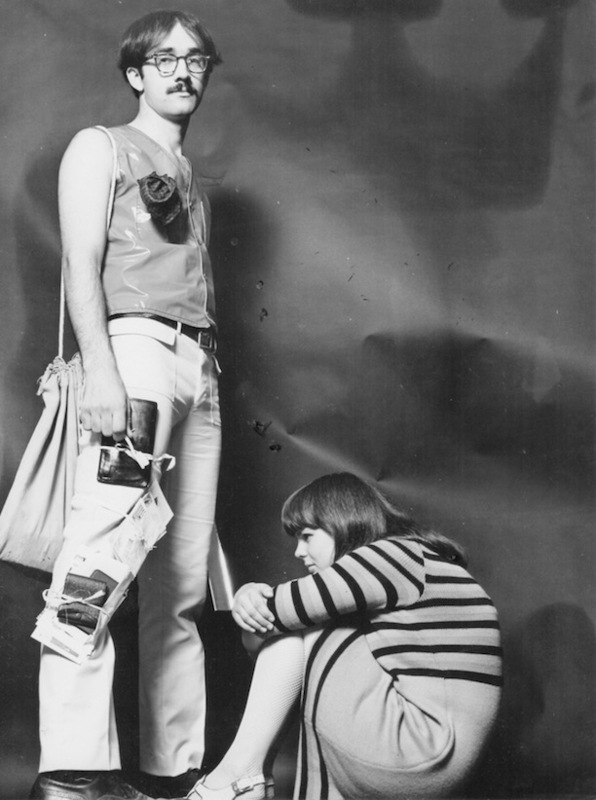 We art students talked our way into the class, and had a blast, as hardly any playwrights picked up a camera (Ron Whyte started a documentary on New Haven drag queens, which, you might say, probably influenced Caroline and I to do screentest six years later in NYC). So, at the end of this one-year experiment, Mr. Levine wanted to see what everyone had produced, because he would send the ‘best’ student to intern on one of his European-produced films (often with Sophia Loren and/or the like). 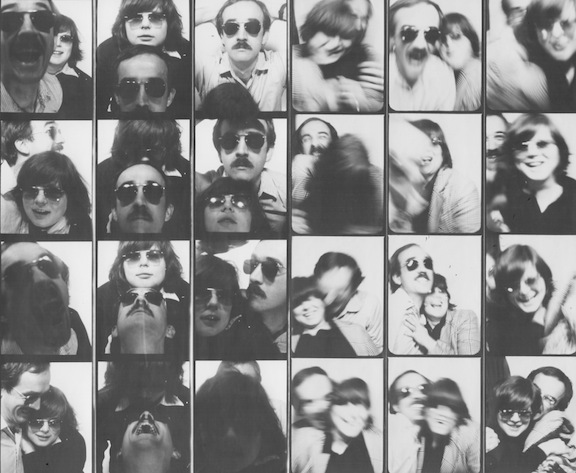 Caroline and Frank Mouris: photobooth fun in the late 1960s, in New York. “Only problem was, he hated everything except my film, which we pretended had been produced in his class (for the life of me I can’t remember if it was Quick Dream or You’re Not Real Pretty But You’re Mine). Peter Schlaifer won our graduating class’s fellowship and went to Europe for the summer, but I felt like I won the lottery when Levine set me up with Richard Williams’ animation studio in Soho Square, London, to ‘help’ with the animated titles for a Woody Allen-scripted film, Don’t Drink the Water. From 1969 to 1972, after his graduate-school years at Yale, Frank Mouris taught animation at Harvard University, which had been his undergraduate alma mater. (He was admitted at Harvard University admissions officers by building a scale model in cardboard of the Globe Theatre that Shakespeare immortalized.) He then set up his own business in New York City, and was soon working with Caroline Mouris, his wife since 1966, on their celebrated animations. 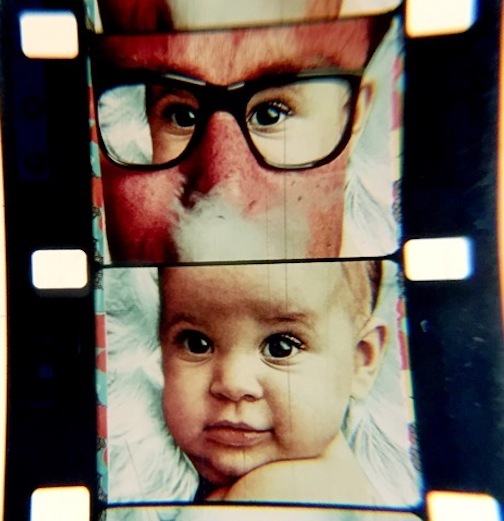 The Yale archive has about 5,000 film prints in 35mm or 16mm, as well as a library of about 30,000 films on various media, with an overall goal of preserving and providing access to film for film study and appreciation. The collection is “not robust” in its holdings of experimental film compared to the Academy Film Archive and Anthology Film Archives, but has always had an interest in experimental film, says Meacham. 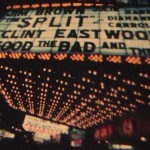 He hopes that restoration and preservation of the original film elements will be completed by early 2016, with audio-restoration on one film, to be done by Audio Mechanics in Los Angeles, the most time consuming. 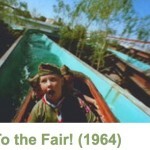 It will result in a new preservation negative, screening print, and digital reference copy of each film. Meanwhile, Meacham is planning a presentation at the Yale Film Study Center of the three, short NFPF-backed films, with Frank and Caroline Mouris in attendance. It’ll be a sort of pepremiere, as they haven’t been projected since Frank Mouris showed them to his fellow graduate students and instructors in the late 1960s.